MARBLE FALLS, Texas - With new product rumors and speculation running rampant on the eve of Apple's big September 5th media circus, the blogosphere is buzzing that Google Inc. is set to announce the release of it's own cellphone, dubbed the GPhone by loyal cult followers. 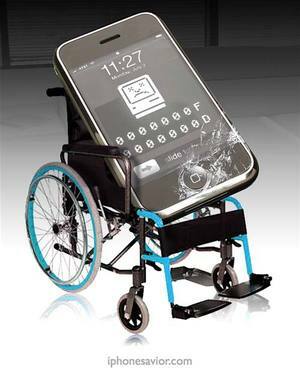 Technology analyst Rob Enderle predicts that the GPhone -- if it truly exists -- will be an iPhone killer. CrunchGear said the new HTC/Google phone will be based on a Linux platform and have Google Talk enabled, allowing users to make free Internet phone calls. Blogger Mark "Rizzn" Hopkins, freelance project manager for The Rizzin Network claims to have a well-placed source inside Google that indicated the GPhone will cost just $100, aimed at beating the $100 laptop (which is now priced at $188). Hopkins would not verify the two week timetable for a GPhone release. Is it possible that a new mobile technology savior is lurking on the horizon? 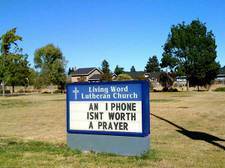 Reverend Louis Cypher of The Living Word Lutheran Church in Marble Falls, Texas has joined in the fight against the hysteria surrounding the iPhone. Cypher has publicly posted anti-iPhone slogans every week since Apple's June 29th launch in attempt to kill the cult-like worship of the Apple iPhone in his small community. "I support Google with daily prayer for the GPhone to crush that ungodly Jesus Phone" Cypher said, "It's a cult, it's idol worship and I'm not afraid to tell everyone in Marble Falls that Jesus don't need no phone." Cypher insisted it's no mistake that cult followers have dubbed the mobile Google product "GPhone" indicating "God Phone", making it superior to the Jesus Phone and contrary to the popular opinion by some church members that it means "Goliath Phone". Those members were quickly admonished by Reverend Cypher who insisted that the name "Goliath" is not really a good thing. The name was abandoned immediately. The GPhone has harnessed more fantastic speculation than Area 51 ever did. Though most outsiders cannot confirm if such a phone really exists, a cult following is forming at a rapid pace. All this in preparation to worship a new savior should the sky crack open and one appear wearing an embossed gold "G" bathed in holy light. Is the GPhone the new savior or another false mobile messiah? Only The Magic Eight Ball knows for sure. Gphone is not as popular as iphone so far.